Bryant Park Blog: Are You A 'Bryant Park Couple'? Are You A 'Bryant Park Couple'? We constantly hear from folks who met their future spouse, became engaged, or even tied the knot beneath the beautiful London Plane trees of Bryant Park. To honor these couples, we are planning a special celebration in the park this June. If Bryant Park played a role in your love story, we’d like to see you and your significant other at the event! Please send your “Bryant Park Love Story” to Susie Sigel at ssigel@urbanmgt.com or call (917) 438-5151. 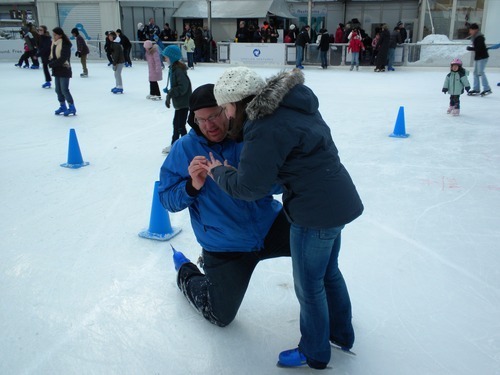 This heartwarming story was sent to us by Sarah and Shawn from New Jersey, who became engaged at The Pond last year. Shawn and I met when we were 23 and 24. We’ve been dating for six years and have been seriously discussing marriage for the last six months or so, and had gone so far as to look at rings together. As much as I was expecting a proposal in the near future, I didn’t think anything was going to happen before Christmas. It’s hard to explain, but he completely surprised me. On Sunday, December 20th of this year, we decided to go ice skating at The Pond at Bryant Park. This would be my second time on skates and Shawn’s first so we were looking forward to it. It was the day after the first big snowstorm of the season, and Bryant Park looked absolutely magical - like a winter wonderland. When we were renting skates, we realized they didn’t have any size 15 skates for Shawn (giant, I know). So he crammed himself into a pair of size 13 and was eager to hit the ice. At the time, I wondered why he was so willing to skate in tight skates! We skated for a while, then he “fell” in the middle of the rink… and I went skating past (I had momentum going!). Shawn called for me to help him up, so I slowed down, turned around and started making my way back to him, telling him “how can I help you up? !” Shawn is a big guy at 6’6”. A security guard on skates reached him faster than me and tried to help him up but Shawn told him he was fine. I didn’t realize he was down on one knee. I went to grab his hand to help him up, and there it was- the ring! He asked me to marry him. As much of a public proposal as it was, not one person (aside from security and Shawn’s friend who was snapping photos) noticed! It was beautiful. There we were, kissing in the middle of the ice, and everyone kept skating around us. It was so romantic. Afterwards, we walked around the Christmas Market. I stopped in an ornament shop on a whim and bought two ornaments: one “Our First Christmas” ornament with our names on it and another that’s a single ice skate that reads “Bryant Park 2009.” A perfect way to commemorate the day!